Walking with my Dad down to the downtown area of my hometown. My folks dressed in Victoria era costumes and help lead the trolley rides past historic homes (including theirs, which is a Victorian two-story that they restored 4 years ago). 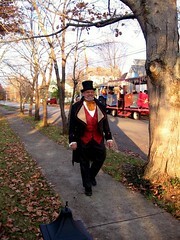 I think Dad looks pretty spiffy as a Victorian gentleman.